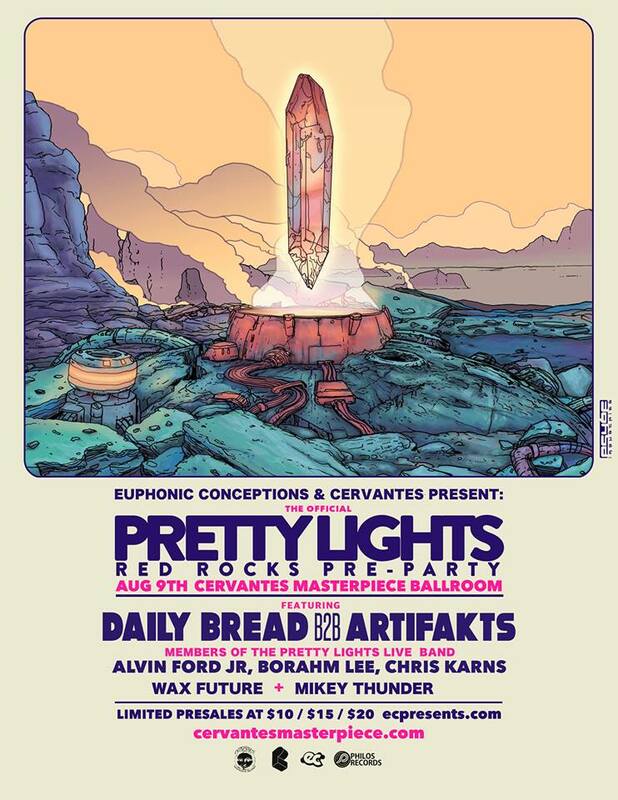 Getting the Pretty Lights Party Started With Daily Bread B2B Artifakts, Members of the PL Live Band, and More! Kicking off one of the biggest weekends of the year for music in Colorado, Pretty Lights’ ten year anniversary at Red Rocks, Philos Records producers Daily Bread and Artifakts are headlining a sold-out preparty at Cervantes Masterpiece Ballroom with a back-to-back set. The bill leaves little to be desired; featuring a three piece collective made up of PL’s live band (Borahm Lee, Chris Karns, and Alvin Ford Jr.), as well as Philadelphia duo Wax Future and OG PLM veteran Mikey Thunder. Excitement is high, and although tickets are hard to come by, Cervantes has partnered with Lyte as their official ticket exchange program for the night to help people buy and sell tickets to the events. To learn more, check out this link. Daily Bread and Artifakts have been making big moves in 2018. The duo have made b2b appearances everywhere from Colorado to Wisconsin to their current resident state of Georgia and a few surrounding states in the south. Serious Pretty Lights fans are no-doubt familiar with the two’s fire studio releases and amazing live sets, but in case you’re new to the two – Rhett Whatley, aka Daily Bread, is an Atlanta native with an electro-soul sampling style similar to PL but with a dirty south flair that sets him apart from other producers in the sector. Artifakts, or Garret Meyer, has toured extensively with members of Pretty Lights Music, and produced a laid-back funk remix to “Hot Like Sauce” that caught the attention of PL fans across the map. Originally from Milwaukee, Meyers recently relocated to Atlanta to stay close with his fellow Philos Record labelmates. The result has led to collaborative success in the studio and on stage for Artifakts and Daily Bread. If you can’t score tickets to the pre-party, check out their set at Hodi’s Half Note on Tuesday. What is there to say about a set featuring PL Live Band members Borahm Lee, Chris Karns, and Alvin Ford Jr.? The trio played a completely improv set at Cervantes’ weekly Re:Search show a few weeks back that blew us away. With Karns leading the charge spinning everything from old hip-hop and disco samples to deep space dub, complemented by Lee’s flavorful keyboard playing and Ford’s bodacious beats, Pretty Lights fans will no doubt appreciate this Red Rocks warm-up. Sit-ins from Adam Deitch and New York lofi producer Birocratic made the last experience truly special, and fans of the artists hope to see them join the party again for this go-around. Pretty Lights fans probably recognize Wax Future from their frequent appearances at PL events during the last Episodic tour; the duo’s powerful electro-funk sound is definitely unforgettable. The band is made up of Keith Wadsworth on guitar, and Connor Hansell on production. Making an appearance closing out the night at Artifakts’ most recent Re:Search show, the duo was in great form, and it’s always a treat seeing them rock a function of any kind. The OG Mikey Thunder is truly the cherry on top of this funk-filled PL Preparty sundae. 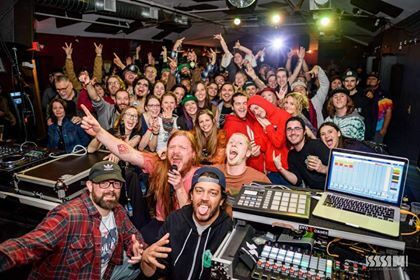 Thunder is a veteran to the Colorado music scene; from playing tweeners at Red Rocks for Derek to smashing his set every Wednesday at Cervantes, the dude has shared the stage with some legends and his mixing skills matched with his ability to mirror the vibes of the night is second to none. Also, fans of live scratching will not be disappointed by Thunder’s lightning-fast hands. Thunder is frequently joined by Re:Search resident Jordan Polovina and his Party People bandmates, so expect a fair amount of MCing to take place during his set.